Liverpool face Leicester City in the League Cup third round on Tuesday evening; here are the key statistics and facts ahead of the clash. Liverpool’s all-time League Cup has seen them win 140 games out of 233 played. Should Liverpool lose this game it will be their 50th defeat in the competition. Last season Liverpool reached their record 17th semi-final but failed to add to their record 12 final appearances and eight competition wins, losing both legs 1-0 to Southampton. Should Liverpool fail to find the net it will be the first time since August 1979 they have not scored in three successive League Cup games, when they went a club record five matches without a goal in the competition (the only time they have gone more than two). 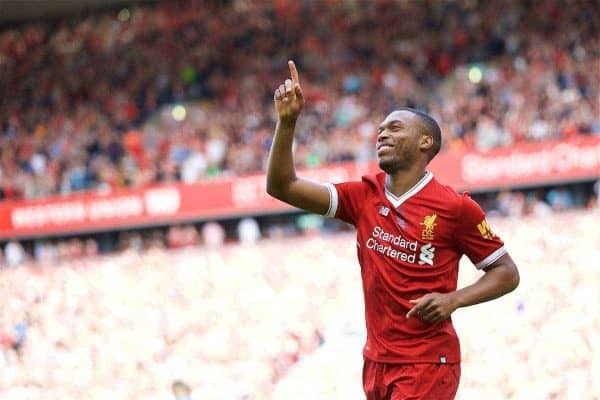 Daniel Sturridge has scored eight goals in eight League Cup appearances for the Reds, and has 10 in 14 games in his career. Two goals will see him become the 9th player to reach 10 goals for Liverpool in this competition. 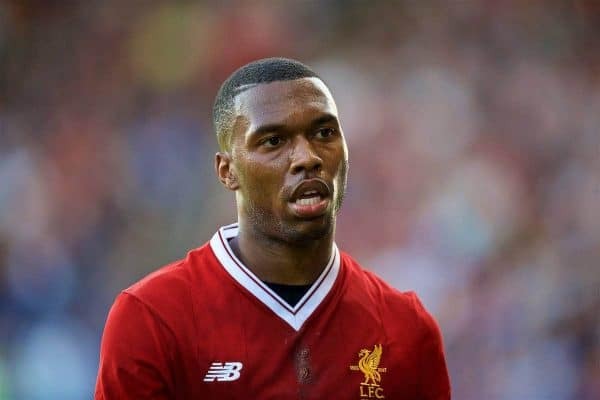 Sturridge has scored 99 goals in his club career, with 61 coming for Liverpool. Last season Ben Woodburn became the club’s youngest-ever scorer when netting in front of the Kop at home to Leeds. He was aged just 17 years and 45 days. Ragnar Klavan scored his only Reds goal so far at this stage of last season’s competition in the 3-0 victory at Derby. Alex Oxlade-Chamberlain has scored six goals in 13 career League Cup appearances. Liverpool have scored in 20 of their last 22 games in league and cup. The Reds are four goals short of recording 200 in all games under Jurgen Klopp. Robbie Fowler is the only Liverpool player to score a hat-trick at Leicester, doing so in a 4-1 league win in October 2001. Mohamed Salah 5, Roberto Firmino 4, Sadio Mane 3, Emre Can 2, Trent Alexander-Arnold 1, Sturridge 1, own goals 1. Jordan Henderson has played more League Cup games for the club (20) than any other current Reds player, with his one goal coming against Notts County at Anfield in August 2013. 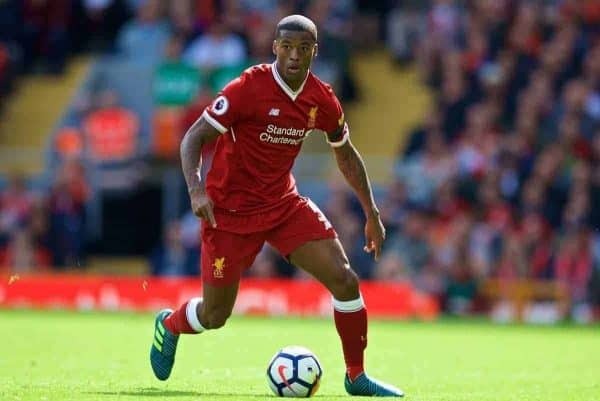 Gini Wijnaldum could play the 50th game of his Liverpool career in league and cup. Possible League Cup debutants for Liverpool this evening could be Salah, Joe Gomez, Oxlade-Chamberlain, Andy Robertson, Dominic Solanke and Danny Ward. 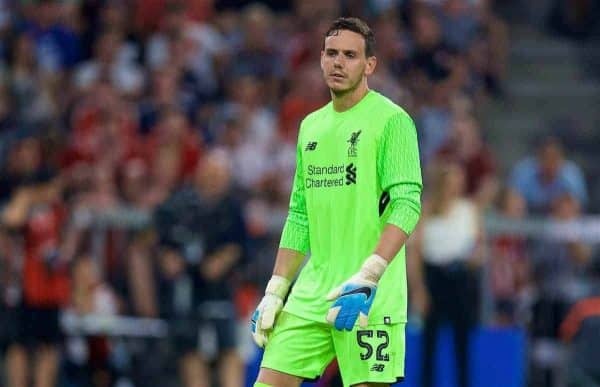 Ward made his last Liverpool appearance in a 3-1 league defeat at Swansea in May 2016. Both of his previous starts for the Reds have come away from home. Liverpool have not conceded more than one goal in any of their last 16 games in the competition since Middlesbrough scored twice in the 2-2 draw at Anfield in September 2014, the Reds prevailing on penalties. The last time they let in more than once in a game away from Anfield was the Final itself against Cardiff in 2012. Of the Reds 18-man squad that day only Jordan Henderson remains at the club. They last conceded more than one goal on an opponent’s ground in October 2009 when they lost 2-1 at Arsenal. Arsenal‘s Julio Baptista is the only player to score a hat-trick against Liverpool in the League Cup, hitting four in a 6-3 Anfield win in January 2007. The Reds have been involved in 10 League Cup penalty shoot-outs, winning seven. They have been successful in 14 out of 18 in all competitions. Liverpool have played 11 games against City in the two domestic cups over seven ties and have progressed five times. The only occasions Leicester have won were both in the F.A. Cup. In those 11 games the Foxes have scored five times in total and never have they scored more than one goal in a cup match against Liverpool. The teams have met only once in this competition. In October 1986 Liverpool won 4-1 at Anfield in the third round, with Steve McMahon hitting a hat-trick (having netted four in the previous round) and Kenny Dalglish scoring the other. Gary McAllister was in the visitors’ side that evening. The Reds went on to reach the final that season, losing to Arsenal. The Foxes have reached five League Cup finals, beating Stoke in 1964, Middlesbrough in 1997 and Tranmere three years later. Their two losses in the final have come against Chelsea in 1965 and Tottenham in 1999. Since winning the trophy in 2000 City have never gone beyond the quarter-finals and have only reached the fourth round on five occasions. Leicester reached this round by winning 4-1 at Sheffield United last month, with goals from Demarai Gray, Islam Slimani (two) and Ahmed Musa, with the game’s five goals all coming in the second half. They have lost five of their last seven home meetings with Premier League opposition in the League Cup. It is 45 years since the Foxes recorded a third successive home win over Liverpool in all competitions. They have not won in three games since winning at Sheffield United in Round Two, losing at Manchester United and at home to Chelsea before drawing at Huddersfield last Saturday. 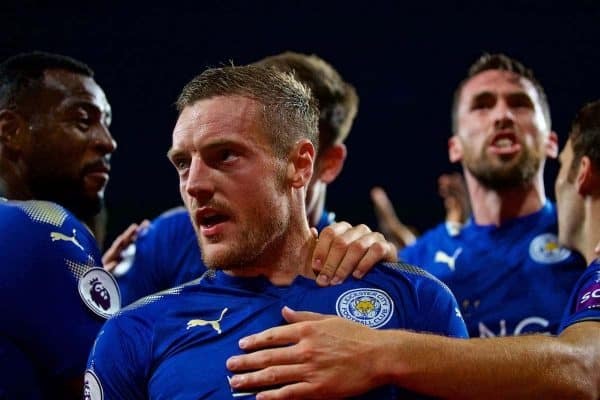 Jamie Vardy 4 (0), Shinji Okazaki 2 (0), Slimani 2 (2), Gray 1 (1), Harry Maguire 1 (0), Musa 1 (1). *Stats courtesy of LFC statistician Ged Rea.